When adding a source in Kodi, you may receive the following error “Couldn’t retrieve directory information. This could be due to the network not being connected. Do you want to add it anyway?“. This error will always show up when trying to click “Ok” when adding the source, and there are a few reasons why. You can see an image below of what this error usually looks like. It’s an annoying problem to face, and one that also everyone will go through. Thankfully, this doesn’t mean there is anything wrong with your actual Kodi device. Instead, it’s more likely going to be a problem with the host. We have a small guide below which should help you troubleshoot and fix this error. Mask your IP Address & Hide your streaming habits. Prevent your ISP from spying on you. Make your online presence anonymous. Allow access to blocked add-ons & content from other countries. Basically, this error means that it can’t find the Source you have inputted. Incorrect URL input: The most likely reason for receiving the ‘Couldn’t retrieve directory information’ error is mostly due to an incorrect Source URL being inputted into Kodi. Make sure that you’ve inputted every character correctly and that there is no spelling mistakes. 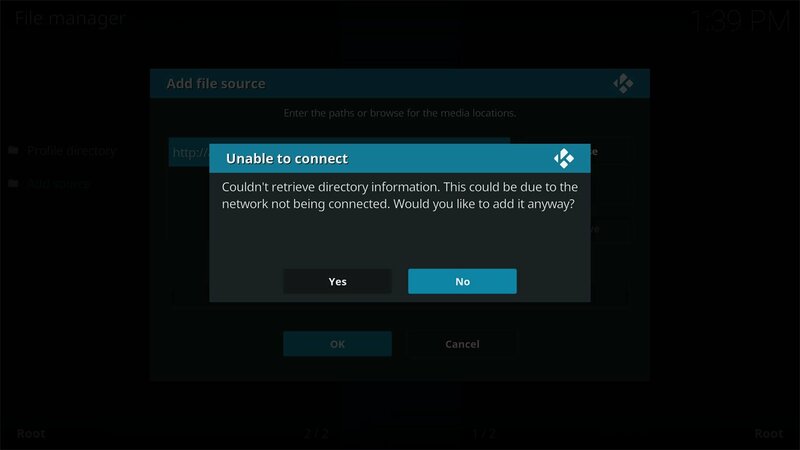 Source is down: If your internet is working correctly and the correct URL has been inputted in Kodi, then there’s realistically only one more reason that you are receiving the Couldn’t retrieve directory information error. The source is probably down, and you can check yourself whether it is working. Check below. This error could come from something simple. Using Googles URL on the image above, you can see that I forgot a ‘/’ in the URL. With this URL not existing with a / missing, the ‘Could not find directory’ error will appear. Checking if a Kodi Source is still working is pretty easy. On your mobile device or computer, enter the source name into your web browser. When you enter it into a browser, a page shows up which contains a ZIP while which proves the Source URL is working. 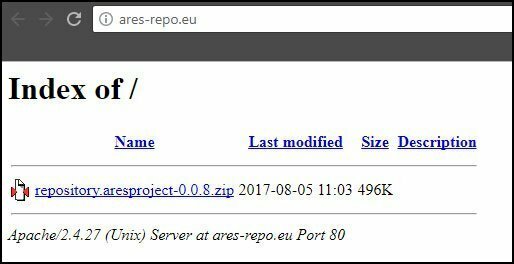 However, if we where to enter an incorrect character and try http://aras-repo.eu/ we see a “This site can’t be reached” error. In the URL, I changed Ares to Aras. Although Ares Wizard isn’t a thing anymore unfortunately as of 2018. Testing a source URL in your browser on your PC or Phone is a good idea if your Kodi is set up on a device is set up on the Fire Stick. Nobody wants to spend all that time typing the URL character by character for it to not work. My connection is up and running but when I type the Kodi URL in a browser in my phone it gives the same error. Is there another Kodi path I can use??? Get rid of spaces at beginning and end of URL!!! we are trying to reconnect our kodi and keep getting the above era. internet is working could you help me. I have downloaded Kodi and every file source I am told to type in and give a name comes up with couldn’t retrieve directory information. This could be due to network not being connected. Grrrr it does it for every single one I have tried!’ What is my issue here?? I was having the EXACT same problem until I thought I’d try something. for some reason, Kodi kept putting a space in front of my file source, which obviously messed it up. try deleting that space, if it exists. I am on a amazon fire stick on my tv and trying to download the Covenant add on and a few additional ones. When I type in the URL and press done, it’s states I am not connected but I am connected. Do you have any simple instructions? Thank you. Hi Sam, did you get your issue resolved regarding error message Couldn’t retrieve directory information when trying to add source. I am having the same issue and I have input everything correctly. Tried inputting source in browser and it works? I believe that if the input URL is working in a web browser and not on your device, it’s more than likely a network issue for the smaller device. It possibly doesn’t have a good enough connection. Otherwise, it could be a spelling mistake somewhere. I still cant connect. IPVanish is up and running, im typing everything in correctly, im connected to the internet, I’ve typed the url into my laptop browser and its up and running but wont work on my firestick. WTH?? Why wont this work? Thanks! We’re all people at the end of the day and need to help each-other. I’m new to Android TV but have quickly got the hang of it. Question: sometimes when I’m installing a certain addon I get an window pops up asking for the “Versoin”. I’ve never see this in ANY tutorial online. I’m assuming I should select the first one since I’m running Krypton. Hi, this just means multiple repositories are holding that add-on, and one may be a higher version than the other! In most cases, you just select the one that has the higher version number. However as they both say 0.83 either will work the same. I am also still having the connection error. I have made sure there are no extra spaces, misspellings, or caps. I have also checked through my browser and I see the zip file as u have pictured above and I have checked my kodi settings, network and it shows its connected. I’m using a Samsung Galaxy tab s. I’ve been using kodi for several months on it but recently started having issues when changing my build to Pulse. Could watch shows but would periodically have errors pop up saying something like prv client errors. I got tired of that and decided to uninstall and start clean. Now I can’t get Ares to do anything. This is when I get my connection errors. Help!!! I miss my kodi and don’t know what else to try! I installed kodi as per all available instructions (fixes, that i could find) and I am still getting the error message of unable to connect. I am not to tech savvy when it comes to program issues, but following instructions shouldn’t be a problem. Is there a stepwise informative way to try installing an add-on repo? I don’t have one on my site currently. If you’re still getting the error, it could be that the link isn’t working. You can try putting it into your web browser and see if any sort of web page loads up, if not the link must be down. Thanks so much for your help in the two matters above Phillip. Covenant look and appears very good and your instructions for minimizing the Kodi screen worked to perfection. I do however have one additional question for you and is had to do with using the mirror cast feature on my Sony TV to mirror a downloaded movie from my desktop computer. Essentially how do I Mirror Cast a downloaded movie from my desktop computer over to my Sony 4k ultra hi-def TV? I have the Mirror Cast feature already enabled, set up and working except that when I proceed to play a movie on my desktop that I previously downloaded, I don’t see the Mirror Cast icon anywhere on the screen to be able to click on so that the picture or movie will be mirrored over to the television. However when I bring up anything on the desktop itself, as in using the browser, the Mirror Cast icon is located or appears in the upper right hand corner of the screen. When I click on it, the TV model number is present and then I simply click on it to mirror the desktop or browser image on to the TV. Appreciate any help at all with my issue. I’ve never heard of mirror cast unfortunately and don’t have any experience with it. If your TV has an app store you might be able to install Kodi on it, and then enable folder sharing on your PC in order to play content from your PC. Can you tell me why this occurs which prevents the movie from playing. I’ve attempted to select about five titles and get the same message each time. Have you experienced this message? I don’t use that add-on anymore, or any add-on for that matter. Did you try installing Covenant? That seems to be peoples favourite choice right now. Hi Phillip: I have Kodi installed on a desktop computer with windows 7 and Google Chrome browser. When I bring up Kodo, it takes up my entire screen and when I want to go back to my browser, I have to continuously exit Kodi. Can you tell me how to minimize the Kodi screen so that I don’t have to exit it each time I want to return to my windows browser? There are 2 things that should be able to work. Hold ALT and press TAB. This allows you to switch between windows that you have open. Hold ALT and press ENTER. This should stop Kodi being full screen and put it in a windowed position. Then when you want Kodi full screen again, just press ALT and ENTER with Kodi open once again.